So I have a Bates Motel themed bathroom... you know, from the movie Psycho. I have a sign above the toilet made out by Norman Bates welcoming you to the motel, a bloody shower curtain with the silhouette of the killer with the knife, little shampoos and soaps and a hand towel that says Bates Motel on it... etc. Anyway, I had this empty spot on the wall in there and I really wanted to put a Psycho poster up. 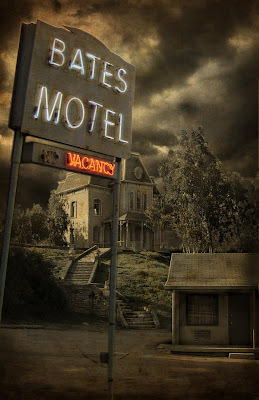 Well, not really one that said Psycho on it, I really just wanted a "Bates Motel" poster to really tie up my theme. I couldn't really find anything I liked, so I made my own. 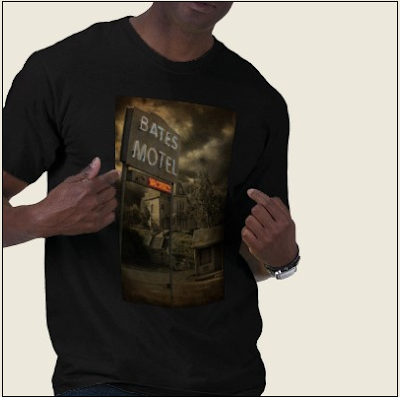 Afterward, I put up some Bates Motel products with the artwork I did for the poster on my zazzle site (www.zazzle.com/asfallleaves) and it got some serious attention. Lots of people liked it and have been checking out the products and getting posters for their homes and sweatshirts and stuff. So I thought I'd show the piece here as well. Got a new painting to show you! Contact me at asfallleaves@hotmail.com for a signed 11x17 print for $14 (includes shipping and handling). Gotta love those classic horror films. 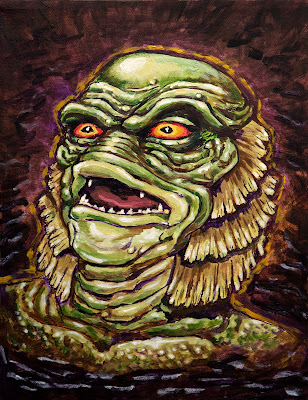 I have a couple commissions to do and then I'll be working on a painting of the Vincent Price 50's classic "The Fly". After that... It's a tie between a painting of Jason Voorhees, The Abominable Dr. Phibes (kissing scene), or a Planet of the Apes painting. What do you think? I'm hoping to get some prints together and do some horror conventions this summer. I'll update you on those as dates are confirmed.